This idea is taken from the work on the Cern website by Mark Boulton Design. Working on a project for a complicated organisation over a long period of time, this design team found it a “make mantra” useful. You can read about the details of this approach on Mark’s blog but the idea is to create a short statement or phrase which can act as a guide through the project. 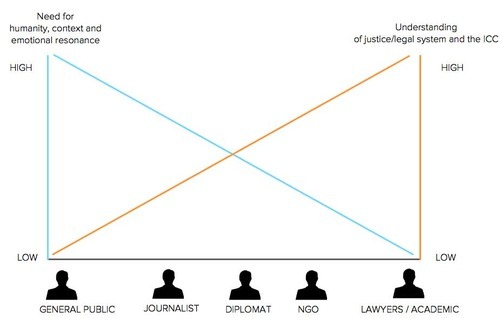 One of the trickiest parts of the ICC digital project is the diverse audiences and the difficult subject matter, so our make mantra – justice for humanity – is intended as a way to remind us about all our audiences and modulate what we say accordingly. At one side we have the general public, who have little understanding of the ICC and how it operates, but they have a need to connect with its mission on a human and emotional level. At the other side, we have lawyers and academics, who have a deep understanding of the ICC and international law. Everyone else fits somewhere on this scale. Of course, the nuances of engaging the ICC’s different audience cannot be captured in a single phrase. For that, we have user research, personas, user needs and user stories (more about those later in this blog). Still, we hope you find this useful when considering our approach to different audiences.